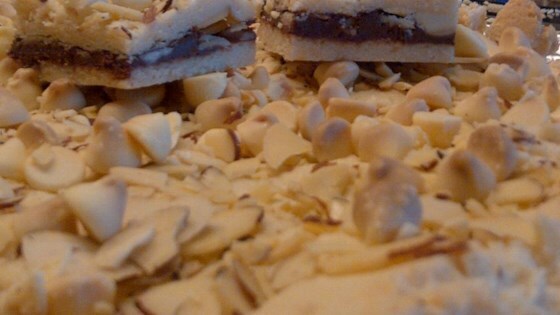 "A great holiday cookie bar. A favorite of my son and daughter." Preheat oven to 350 degrees F (175 degrees C). Line a 9x13-inch baking pan with aluminum foil; grease with cooking spray. Combine white cake mix, milk, melted butter, and vanilla pudding mix in a large bowl; beat with an electric mixer until well blended and thick. Divide dough into 2 pieces. Place 1 piece of dough between 2 large sheets of waxed paper; roll into a 9x13-inch rectangle. Peel off waxed paper and press the dough into the bottom of the baking pan. Bake in the preheated oven until dough is pale golden, about 10 minutes. Sprinkle half of the sliced almonds, white chocolate chips, white baking chocolate, and hazelnuts on top; press into the soft dough. Place chocolate hazelnut spread in a small microwave-safe bowl; heat on medium-high, stirring often, until melted, about 1 minute. Spread over dough. Place the second piece of dough between 2 large sheets of waxed paper; roll into a 9x13-inch rectangle. Peel off waxed paper and lay the dough over the chocolate hazelnut spread. Sprinkle remaining sliced almonds, white chocolate chips, white baking chocolate, and hazelnuts on top; press into dough with a spatula. Bake in the preheated oven until dough is golden brown, about 15 minutes. Let cool completely, about 1 hour. Refrigerate until firm, 3 to 4 hours. Cut into bars. I measure my waxed paper sheets to fit the baking pan and lightly spay them with cooking spray to make transferring the dough easier.